In office premises in Horten, in the development company ORP – Oslofjord Ressurspark, you will find Bård Haug. On his shelves he has two patents, and in his head he has ambitions. 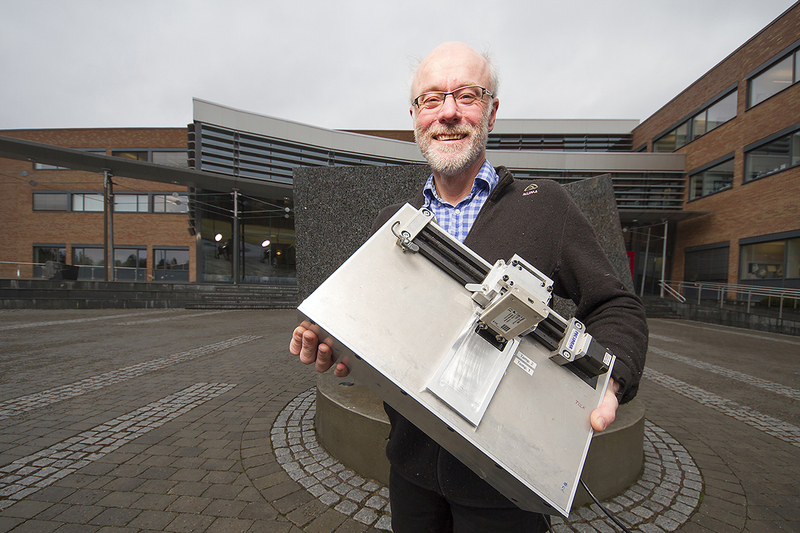 The patents were the brainchild of his former colleague, Frank Karlsen, at the University College of Southeast Norway and deal with genetic analysis and particle separation. According to Haug, the patents open up for opportunities in medicine and early detection of cancer. But what does this have to do with closed fish farming facilities? For ORP, it’s about market strategies. “The instrument we are developing can be used to measure any and every biological activity. But we are a small start-up company and had to decide which industry we were to focus on,” says Haug. “In CtrlAQUA we saw a national, resource-strong group in an industry that needs improved disease control. I am a marine biologist with a history from fish farming, so this is familiar country for me,” comments Haug. He also wants to contribute to sound management and production of fish in Norway. “Our tool is nano- and microtechnology,” says Haug. In addition to patents and ambitions, ORP has the electronics company Mectro next door. They will put the technology into production. And they are well on their way with a prototype that will be ready in the spring of 2017. ORP’s primary contribution to development of closed facilities is the analytical instrument “PocLoc” which will measure the pre-stages of disease. With the technology they are sitting on for genetic analyses, they will be able to automatically measure whether a disease-triggering pathogen is present in a tank of fish, and the activity level, long before there are any visible biological consequences apparent on the fish. The knowledge on particle separation is used to collect enough data on sampling. This means that they can extract minute traces in a concentrated sample from a cubic metre of water. Post-doc Nhut Tran is working with this technology in a separate project in collaboration with Nofima. Haug could not have wanted a better laboratory than that provided by closed containment aquaculture systems. These have full control of the water parameters. For Haug it is also important to work in clusters with people who have the same understanding as them. In CtrlAQUA, this common understanding is that control is important. “Clusters are a type of collaboration that is essential if we are to succeed. We are dependent on the cluster in Horten and the cluster in CtrlAQUA. “To illustrate how extremely important CtrlAQUA is for a small founder company like ours, we can look at turnover. About 12 % of turnover goes to our membership subscription to be in the centre. But we believe that as early as 2018 or 2019 we will have products on the shelves. Then things will be easier financially”. Discussions with partners in the centre have given Haug good ideas on the way forward for this small company from Horten. For example, salmon sea lice, poisonous algae and food safety monitoring on the salmon harvest process line. “We will continue in fish farming and develop ORP further in this sector”, says Haug.